You know it's super lucky to see a double-rainbow the day before a race, right? Oh. It isn't? Oh well, now it is. Behold! Since Travis was out-of-town for the weekend, Lolo was going to sleepover (girls' night!) on Friday and then we'd carpool with Kerrie and Karla to Tacoma the next morning. Of course we had to fuel up for the race by having some yummy pasta, a beer and part of a pazooki at BJ's restaurant that night. Delish! Goober was super helpful reading the menu to Lolo and I. This race was a couple firsts for me: first time I've paced a friend (my best friend, Lolo, who is a newbie runner) and first time Goober has run with me in the jogger during a race. And perhaps a couple other "firsts" I'll mention later. It definitely was memorable. Saturday morning came too fast after a late night chatting with Lolo and attempting to watch some Bridesmaids (Lolo hadn't seen it yet! Say WHAT?!). 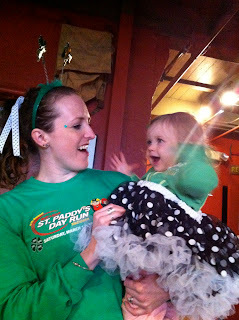 I scrambled to get all our lovely St. Patrick's day garb on, wake Goob up, feed Goober, get the jogger in the SUV and try and remember to eat something before Karla and Kerrie showed up. Oops. Forgot to eat something! 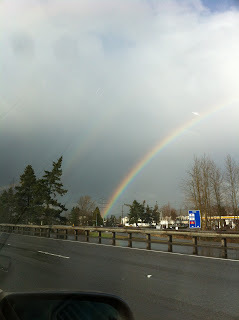 We piled into the SUV and it was a cozy ride to Tacoma. Oh, and it was snowing. Snow/raining actually. Did I mention it was freaking snowing? Oh goodness, this will be interesting. Another first for me: not wearing a billed-hat at a rainy race (not the best decision). Anyway, we parked in a lot that was a couple blocks from the start, which wasn't too bad, but since it was freezing out and pouring rain we all jogged to the start. Karla was doing the 10K and didn't have that much time to pick up her packet before the race. Bad omen...the packet pick-up line was ginormous, longer than the porta potty lines. That's another first. 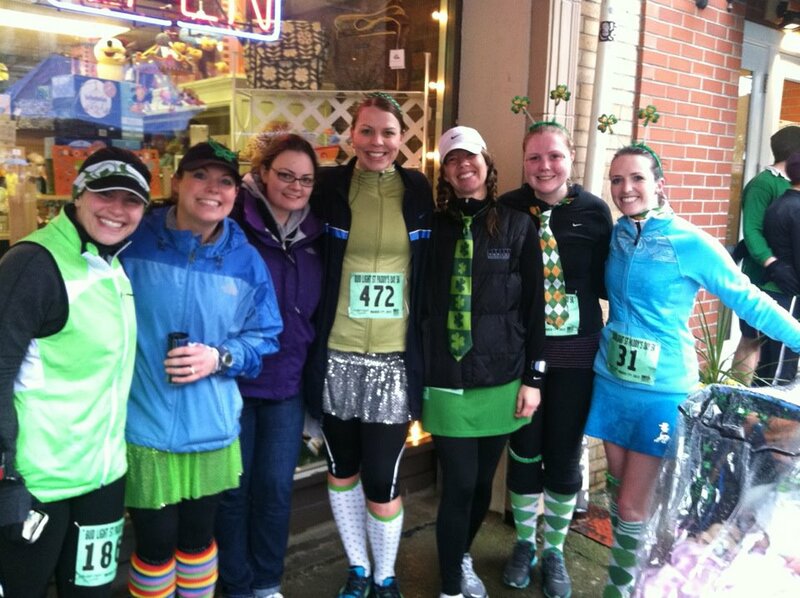 We waited in the rain and finally got our bibs, shirts and timing chips. Goober was holding it together despite wanting to rip off her warm hat every so often. I was already soaked to the core. Rain was dripping off my eyelashes and running down my face. 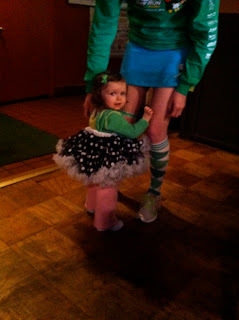 I couldn't feel my hands, so thankfully Mel helped me pin my bib on my Brooks jacket (a gift from Mel! ), which was over my long-sleeved Brooks shirt (another gift from Mel when I had Goober). Another first: I wore two long-sleeved shirts at a race...WOAH. We waited under the awning of Hal of a Sub with Mel, her sister J, Kerrie, Jill, Tiffany, Alma, Kim, Jamie, Chelsea (such an awesome chick for spectating this crummy race day! ), Lolo, Karla and Goob. Now, Goober was throwing a fit because she does NOT like to sit still in the stroller for very long now that she's an official "walker," so Kerrie, Tiffany and I ran around the block to warm-up. This calmed down the Goob until I started my iPod on speaker, and she was all set to race. Since I was running with Lolo and Goober, we took our place near the "walker" start line. FINALLY the gun goes off and we start to make our way down a big hill to the waterfront. Lolo is being a rockstar and keeping an 11:00 pace for a bit. YEAH! At the 1.5 mile turnaround the 10K runners were swishing past us slower 5K'ers, but some people just didn't listen to the shouts of "on your left!" and "runners coming through!" I felt kinda bad, but I think everyone was just soggy and waterlogged. Kim (running the 10K) shouted my name and held out a hand for a high five as she passed...but my slowness with the jogger caused me to miss. Whoops! Sorry Kim! The rain still doesn't let up, and at around the 2 mile mark we do a little long-stride walking. I'm proud of Lolo! Then there's a giant, long hill back up to the finish and after catching her breath, Lolo finishes strong with Goober and I trailing behind her. Way to go, Lolo! We find the girls and are told that Kerrie not only got a 1 minute PR but also was 2nd in her AG!! How awesome is that? I'm stoked! A couple pictures are taken but we all need food and warmth badly...so we head back to the car in search of Harmon Pub & Brewery (of course The Rock was our first choice, but it was still only 10:30am). 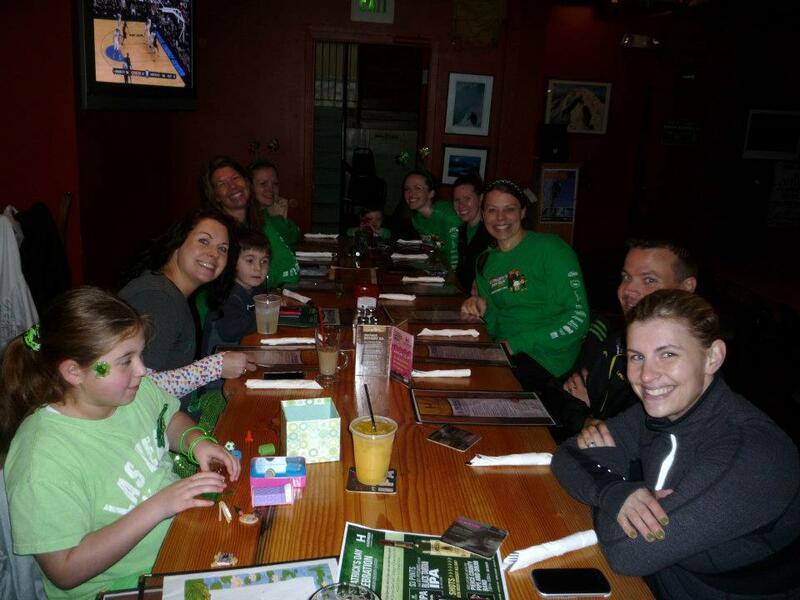 Why not hit a pub on St. Patrick's day? Although the spiked coffee was warm (albeit small) and delicious, the food took over an hour to be served after we ordered. We were hungry runners! 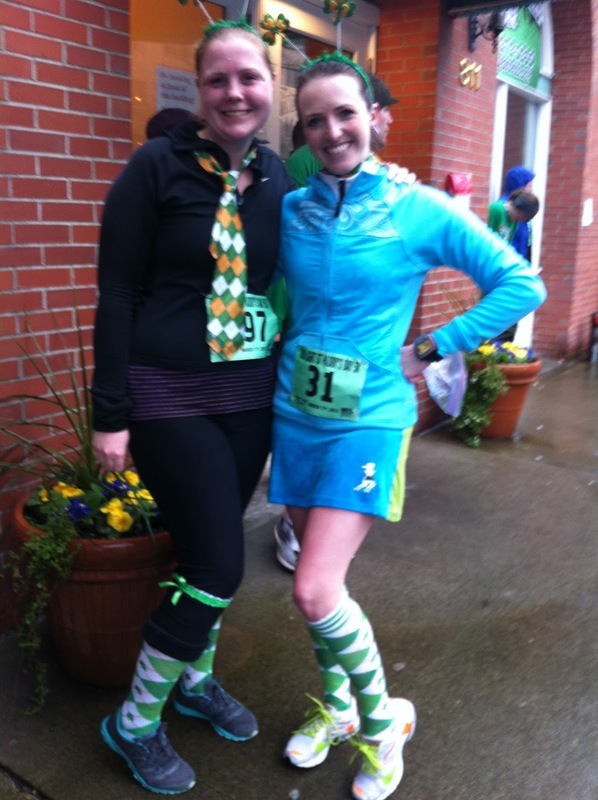 Thankfully our cheerful conversation and race recaps took our mind off the wait. 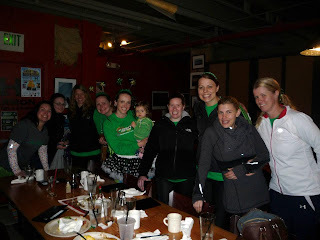 These ladies are so much fun to be around...I'm a lucky runner! I got pancakes and scrambled eggs for me and the Goob. She devoured the eggs (I swear sometimes she doesn't chew) and decided to try on the RazzyRoo tutu I was sporting (yet another gift from Mel!). It was a really fun day, and of course the SUN was shining when we exited the restaurant...go figure, huh. I think we were all ready for a hot shower and a nap, especially Miss Goober. Poor thing was falling asleep on the ride home and I made Kerrie & Karla keep her up as long as possible (or else she would never have napped well at home!). Success! Great report. That little Goober is adorable (and I'm still loving that tutu). Here's to much warmer weather for Seattle RNR! Great recap! So glad goober came out to race with us! Fun morning! What a debut race for Goob! Awesome to see you again, and great job pushing that jogger in those conditions- you rock! Fun times! Great job!! Your friend did awesome for her first 5k!! I know what you mean by Goob getting fussy when you sit and don't run, my little one does the same thing and she started walking just over a month ago. Goob looks adorable, I love how long her hair is! Very cute socks! I'm impressed with all moms who run with jogging strollers. You rock! I have yet to try a race with a jogger and think it would be fun for my little guy to experience. I think I'll pick a flat one though - you really got a workout with that hill at the end! 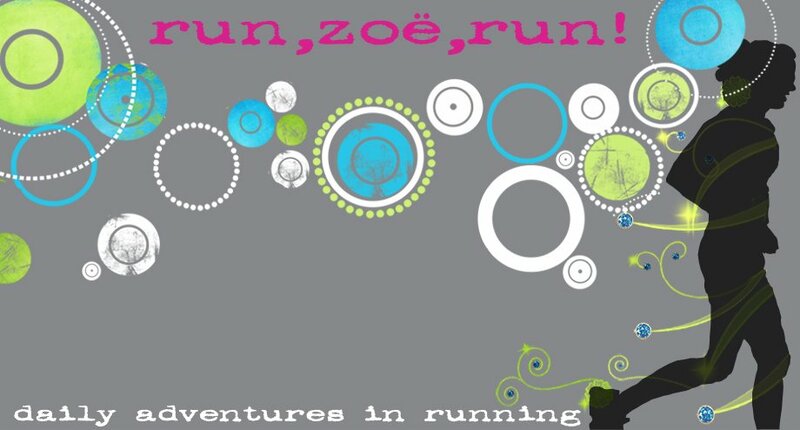 Nice job Zoe! Oh my word...Goober is so adorable!!! You are a rockstar for racing with her. I got tired just pushing Riley around at YGG! Goobs is getting cuter and cuter. I just love her hair, Riley's is only long and flowing on the top which gives her a toupee look! be an effective and positive behavioral changes. Smart UK Replica watches Watches Replica that combines the platform self MotionX that is Designer handbags and quantification in order to understand better themselves than now.Frédérique Constant, Alpina and MONDAINE is for handbagreplica women and men in 2015 to start the 10 different models of Replica Rolex Watches smart watch.Technology platform of MotionX technology MMT, these major brands, the offers dozens of aaa different models.